It's a common occurrence in boat building that once a marque develops and founds success in the larger sizes, it spread its wings further and forgets about its smaller models. Seems Polish builder Galeon does not share this idea, and this new 300 Fly project is testimony to its beliefs in building a complete line of innovative craft. The 300 Fly follows previous latest models in what the Strazyn brand refers to its third generation series, and will also be completely new meaning not based on the 290 it will replace. The 300 Fly now to be its new entry level model is a compact flybridge motor cruiser with a two separate cabins lower decks and a shower head plan; master cabin to fore, and guest double amidships. The main deck offers a living area this having a C-shaped settee to port side, galley opposite, and a helm station. The flybridge presents itself with a center pilot seat and a sun pad to aft. 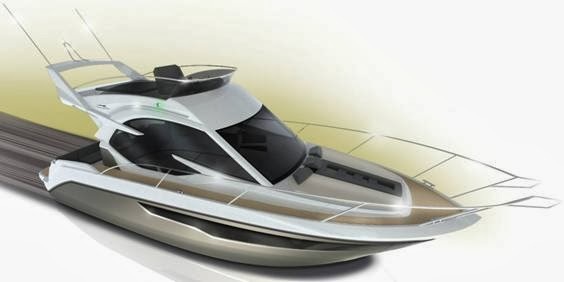 Engines options have not been announced but Galeon says the 300 Fly can be powered by engines up to twin 225hp.